L’Aurore was new-moored off the legendary Plymouth Hoe. After so long at sea, and the strangeness and allure of foreign shores, it was gratifying to take in the deep green softness of England. Kydd’s commander-in-chief, Admiral Collingwood, had been generous in allowing the frigate that had rescued this peer of the realm from a Turkish prison to continue on to England. Now they must part – Renzi to his seat in Wiltshire and Kydd to restore HMS L’Aurore to the blockading fleet as soon as possible. ‘You’ll give my respects to Cec—that is, your noble wife, won’t you?’ That his young sister had married an earl and was now a countess was still a thing of wonder to Kydd. He watched his closest friend swing over the bulwarks and, with a last wave, descend into the boat hooked on alongside. He heard his coxswain Poulden’s gruff ‘Bear off – give way together,’ and saw it stroke smartly off. It had been this way before: a boat bearing Renzi shorewards after far voyaging, once after the near-mortal illness that had ended his naval career, and again after his high-minded but doomed attempt to start a new life in New South Wales, Kydd himself, as a lowly sloop commander, heading ashore to social ruin after spurning an admiral’s daughter for a country girl. But now he and Renzi were immeasurably different creatures. The first lieutenant broke in on his thoughts with a discreet cough. Kydd’s expression tightened. This was not good news: the carpenter suspected rot, and in the worst part of the ship – the garboard strake was the range of planks that met the keel, all but impossible to get to from inboard. It was, as well, the natural resting place for bilge water. In those dark and secretive spaces, ill-ventilated and never to be kissed by sunlight, it would be the first to yield to the insidious miasma that would turn to rank decay. It was said to have been the cause of the loss of Royal George at anchor in Spithead, with the deaths of her admiral and nine hundred souls – the bottom had dropped out of her. And so many other ships had put to sea to disappear for ever, meeting a lonely fate far out on the ocean when rotten timber deep within their bowels had given way under stress of storm. They arrived promptly and disappeared below with their augers and probes but came back up with dismaying haste. The extracted sample told it all: instead of tough, dark timber, this was spongy, white-veined – and spurted foul water when squeezed. ‘We recommends you comes in f’r a better look, like,’ the shipwright surveyor said impassively. L’Aurore went to the trots in the Hamoaze opposite the dockyard, joining the long line of pensioned-off vessels and others for repair to await her fate. A frigate, however, was worth every effort to retain for service and no time was lost in bringing out the master shipwright and his team. L’Aurore was heeled and investigated and the contents of her hold discharged into lighters alongside. Then her footwaling, the inside planking, was taken up to expose her innards. There was no doubt. An area on the starboard side, extending from midships right to her forefoot, was condemned. ‘Middling repair, great repair – either way it’s a dry docking as will take a lot o’ months,’ the master shipwright pronounced. Kydd slumped back in despair. It was almost too much to bear – he knew the navy would not allow them to spend the period in idleness. The expense of maintaining a ship and officers all this time was out of the question – and, besides, the country needed every man jack it could find in its desperate grappling with Bonaparte. L’Aurore would be taken out of commission and her ship’s company scattered throughout the fleet. He had to face it, however much it hurt. The beautifully forged weapon that was his crack frigate was now no more. The trust and interdependence that had grown between captain, officers, men and ship, the precious bond stemming from shared danger, adventure and achievements, was broken for ever. Bowden stepped back as though he had been slapped. ‘I – I . . . Shall you tell . . .? The young lieutenant turned to go. It came out before he could stop it. Years ago, as a lieutenant, Kydd had taken him under his wing as a raw midshipman and had seen the lad develop into a man. Bowden had witnessed Kydd’s reading in of his commission to his first command and their destinies in the service had interwoven ever since. It gets harder and harder to wait for the next title!! Aaaaagh! The wait is too long! October, too long to wait! Hope it doesn’t take too long before we can read the new Stockwin. Looking forward. 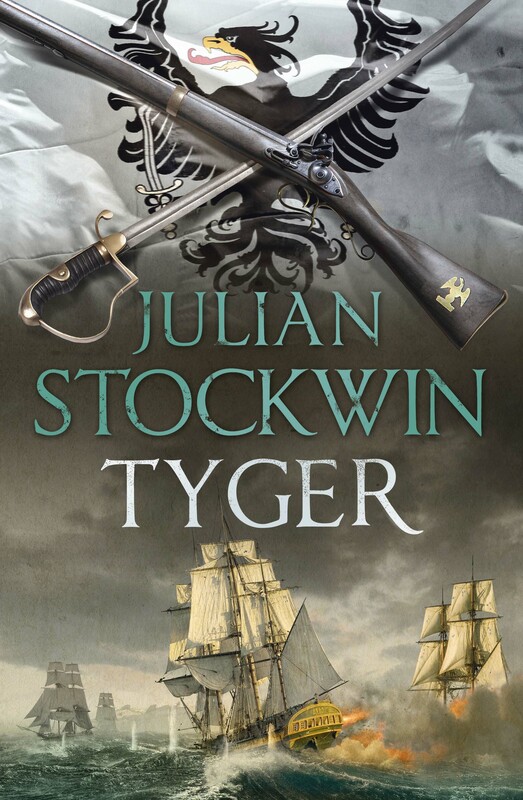 TYGER is out in October. Eagerly anticipating another great read from a master author.